(written by Jen; approved by Ian) In my everyday life, I'm a slave to my to-do list--contentment building with each slash of the pen as I tick off a fulfilled task. But when it comes to our travels, we don't have much of a to-do list. We don't have a list of countries we must go to, camps we must stay at while on safari, or things we must see, except one--see the great migration of wildebeest and zebras. We started our Tanzania trip at the end of June in the Northern Serengeti where the migration and the infamous Mara River crossings were getting into full swing. As nature is never a guarantee, we chose to stay at a camp, Seregenti Bushtops, which we knew would pamper us even if the beasts had different ideas about when they felt like taking on the many dangers of a river crossing--death, dismemberment, drowning, laming. I've certainly procrastinated for less. Day 1. Our ranger, Aloyce, picked us up at the airstrip. Ordinarily the ride from the airstrip to the lodge is dominated by some game animal seeking refuge from the heat under trees. But on this drive, we had a particularly fortuitous and rare sighting--a leopard with cubs. At the camp, the staff was ready to feed us--smart. Food is ordinarily good on a luxurious safari, but the lunch menu awaiting us at camp was such that I thought that they must have read my mind so as to include all of my favorites. We had spaghetti aglio e olio, which is a simple Italian garlic and olive oil pasta, which to be done correctly should be light and subtle. It was. We also had an Asian-inspired matchstick vegetable wrap in which the vegetables still had a crunch and were not overwhelmed by the sauce. Our "tent" was sublime. Each tent is assigned with a butler who prepares your hot tub so that it is waiting for you upon return from your bush drive. Each day on safari at Busthtops is a struggle of wants--I want to lounge around my beautiful tent all day, but I also want to spend all day in the bush scouting out the migration. We went out for our evening drive at 4:30pm. We did not have to go far from camp to find some lazy lions keeping an eye on some wildebeest and zebra. 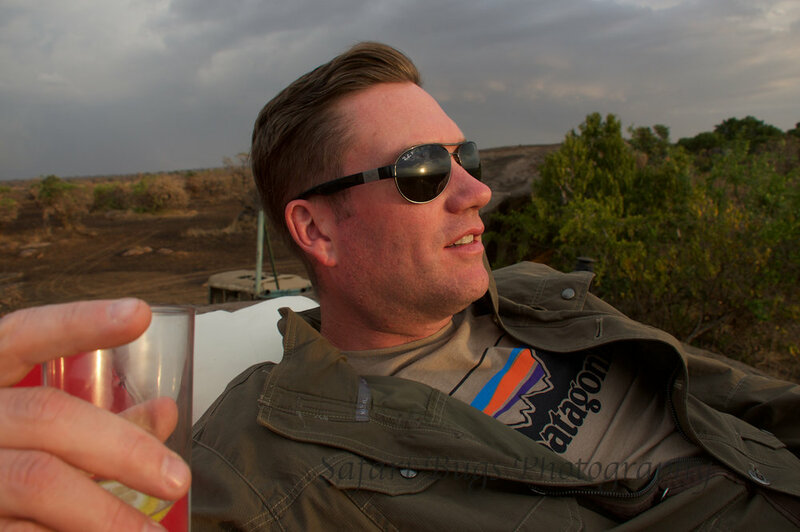 We watched the lions while sipping the requisite safari aperitif--gin and tonic. Back at the camp, we had some more of those gin and tonics by the fire with some homemade meatballs and chips. The dinner set up was perfect for those, like us, who love a quiet dinner by ourselves with great food. Each set of travelers was provided their own table with waiter service. We had a three-course meal, starting with a simple salad and perfectly grilled calamari (in the middle of the bush! ), followed by more pasta for me (of course), and Ian had shrimp in peri-peri sauce. We topped off the meal with banana fosters. Day 2. We opted for an early wake-up call at 5:25 am and a full day out in the bush, hoping to maximize our chances of seeing the wildebeest and zebras cross the Mara River. After breakfast, we started the morning drive headed to the Mara River. As we drove, we heard the wildebeest baying before we could see them. The sound resembled a roaring river. And, with so many prey around, the lions were never far away. When we got to the Mara River, a group of wildebeests and zebras were contemplating a crossing. They are skittish in a group and the slightest sound--a cough, the sound of an engine starting--deters them from entering the river. Attempts are even aborted halfway through as fear takes seize of the mob. Midday we stopped for lunch in the shade with a view of the wildebeest, numerous scrumptious prepared foods (chicken kabab, steak wrap, fresh fruit, cheese and crackers), and chilled Tanzania white wine. Unbeknownst to me, the Mara river is not the only crossing into Kenya. 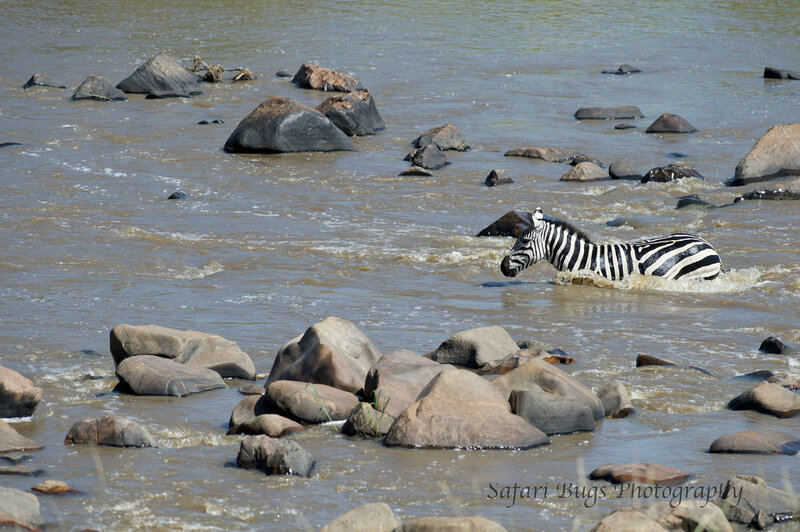 The herds also cross the Sand River, with much less fanfare as when the crossing is made, it is a dry river bed. Prevailing logic makes the Sand River seem like the obvious (and only) choice, but logic is often not what drives the herd. 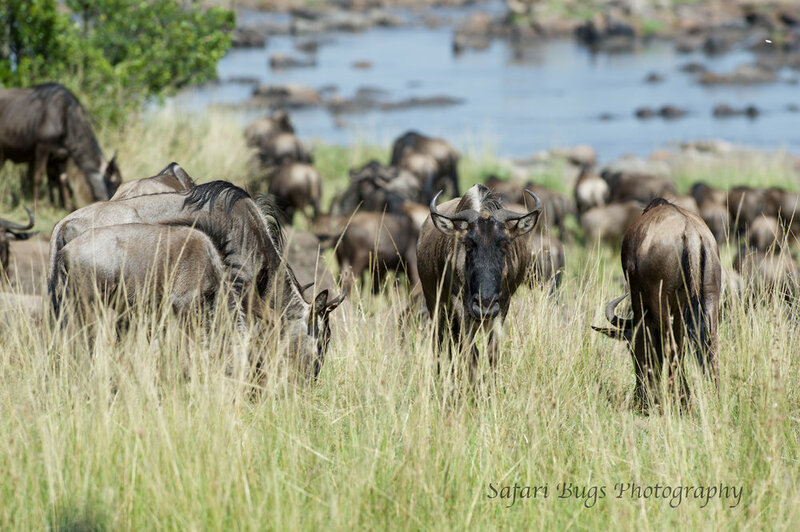 When we approached the Sand River, thousands of wildebeest were kicking up sand as they bolted across the river bed. But suddenly the wildebeest on the far side of the river bed were spooked, running at sporadic angles. As the dust settled, the instigator became clear--a lioness. 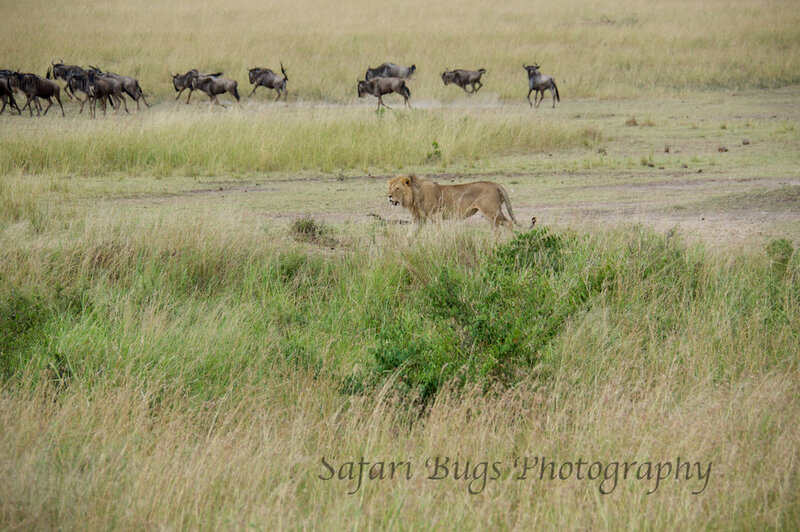 There is no photo of this lioness as we were as surprised by her appearance as the wildebeest were. That afternoon, we arrived back to our a tent where a much-needed hot tub, tea, and coffee were waiting for us. After washing the bush dust off, we joined the other guests around the fire for pre-dinner drinks. For dinner, we drank much merlot and dined on appetizers of grilled calamari and beef carpaccio followed by steak poive with fries and veg and grilled lemon chicken with potato roti. Day 3. The Crossing. We parked at the Mara early, looking over into Kenya. Without much notice, the beasts charged the river in a wild frenzy as if driven by some invisible force. With the hysteria of the migration also comes the patiently waiting predators and clean-up crew--crocodiles, lions, and vultures. The sound of the crossing may have been just as amazing as the visual. Goal accomplished, the rest of the day was spent in repose--leisurely lunch in the bush, massage in the room, drinks by the hot tub, and more drinks by the fire. Dinner was in a private candlelit alcove, and to no one's surprise, I had pasta. Day 4. This day will always be remembered as the day we stepped into Kenya and then back into Tanzania . . . without going through passport control. We drove out to the border where Tanzania hits Kenya in the northern most section of the Northern Serengeti. It was plains for miles. That evening, we took it easy and had drinks on top of a massive boulder. (That's not a sentence I ever thought I would write.) Dinner was in our tent with a menu customized for us. Though I still don't need to tick the box when it comes to our travels, I'm glad we had this must. Photos and videos don't accurately portray the utter magnitude of wildebeest and zebra participating in the migration. 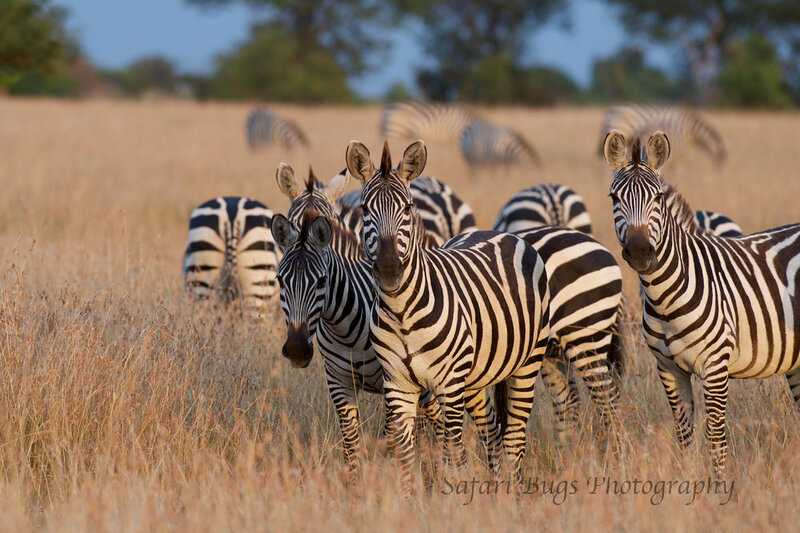 The numbers are such that if zebra are blades of grass, the wildebeest are grains of sand. P.S. This trip was planned by our wonderful travel agent, Jeanie Fundora at Travel Beyond. Jeanie has been planning trips to Africa for 18 years and has been named by Travel + Leisure magazine to its prestigious A-List for her expert knowledge in Africa, having traveled to Africa 23 times. Jeanie is a fierce advocate for her clients, making sure every need is accommodated on diverse trips from honeymoon safaris to multi-generational family safaris in both East and Southern Africa as well as India. If there’s a way to make out-of-the-ordinary details work, Jeanie will find it.